The book The British Virgin Islands - A Photographic Portait, published by Sail Magazine and containing wonderful photos of the BVI by Mauricio Handler, is available in the finer shops in the BVI. This picture is page 111. The fellow on the left in the blue cap is our Anegada buddy Keith Smith. Calling Keith a lobsterman is a bit inaccurate, though. Keith is pretty much the "boy Friday" around the Anegada Reef Hotel. Keith does a bit of everything. 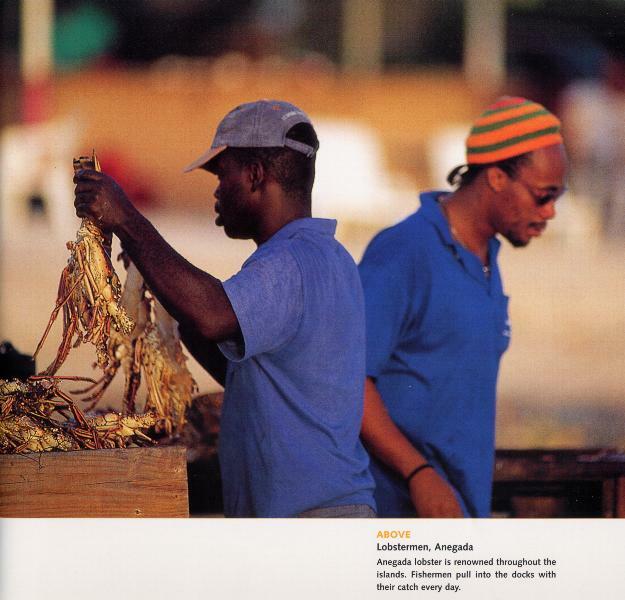 In this photo, Keith is cleaning and preparing lobster for dinner at the famous Anegada Reef Hotel beach barbecue.